David Trafford and Peter Boggis argue that there is often more to operationalising strategy than making structural changes, redesigning processes and training staff. For strategies to be truly successful, leaders need to create the conditions that enable the organisation to pull itself into an improved future – a future that not only reflects the strategic intent, but also becomes operational reality. The role of leaders is to think about the future for which they are accountable – to think about strategies for their organisation that will lead to an improved future. This involves making conscious and explicit choices about what their organisation will (and will not) do. But it’s also about considering the art of the possible, as strategies that cannot be delivered can do more damage than doing nothing. 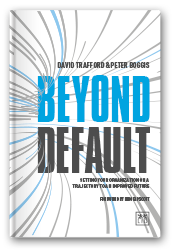 Essentially, it’s about finding a way of successfully shifting the organisation’s trajectory – away from its default future to one that is not only better but achievable. Should strategies be operationalised or implemented? And what’s the difference? Essentially, the purpose of any strategy is to define three things: a target future, a business case and a set of changes needed to realise the target future. If the strategy is accepted, the focus usually moves to implementation or, as some prefer to call it, execution: the assumption being that if the changes outlined in the strategy are implemented, the target future will be realised and the business case achieved. For some strategies, this is indeed the case; for others, it’s not so easy. For example, if the strategy was to reduce operating costs by closing a plant or divesting a business division, implementation is relatively straightforward: plans can be developed and progress easily measured against them. But what if the strategy was more transformational – requiring a fundamental change of trajectory? In these situations is it really possible to set out detailed plans and execute against them? In our view, no. Implementation – as it’s generally practised – is about pushing the present into the future, rather than pulling the present into the future. The push approach is predicated on the assumption that successful implementation is achieved through the execution of a series of steps – essentially, implementation of a pre-defined plan; where the completion of each step takes the organisation closer to its target state. The pull approach takes a different perspective and aims to create a context where people can exercise their judgement, apply their experience and use their expertise to pull the organisation from the present into its target (improved) future. The main weakness of the push approach is that it assumes organisations are deterministic and ‘programmable’. Yet we all know that organisations are not predictable, particularly at times of significant change; they are dynamic systems that respond – often in unforeseen ways – when attempts are made to change them. As a consequence, an implementation plan is always out of date. Furthermore, having such a plan can lead people to believe it is someone else’s responsibility to action it: namely the people implementing the plan. The challenge with the pull approach is that it needs to be embedded within the organisation in ways that lead to intellectual, emotional and physical engagement. And this can only be achieved if the right context is created – a context where everyone in the organisation can constructively contribute to pulling the present into the future. So, when is it more appropriate to adopt the pull as opposed to push approach? If the required shift in trajectory is not significant and the target future is ‘better business as usual’, then the push approach is probably best. In this situation the outcomes are more predictable and therefore plans can be developed and executed. If, however, the target future requires a significant shift in trajectory, and as a consequence the outcomes are less predictable, then the pull approach is more appropriate. Creating the conditions for operationalising strategy therefore depends upon which approach is being taken, ie the push or pull approach. In either case there are some ‘always true’ conditions like leadership, governance, communication, commitment and resources. These conditions are well documented – but maybe not universally applied – and are not discussed further in this article. If the pull approach to operationalising strategy is being applied, we believe there are six additional conditions for success that need to be in place. We believe that when these six conditions are in place, they individually and collectively demonstrate leadership, achieve clarity of communication and build commitment. The six conditions are described below. Note that they are named as outcomes, rather than actions. Organisational capabilities managed as a portfolio. Organisation designed as an adaptive system. Change initiatives managed as a portfolio. The aim of these conditions is to create a context where strategic intent can be translated into operational reality. All organisations are on a trajectory to their default future – which is the place where it will end up if no action is taken, other than that currently planned. The default future is not a result of doing nothing, but rather the end-result of currently planned actions and plans. The purpose of a strategy is to confront this default future, and if it is unacceptable take action that will change the trajectory to one that takes the organisation to its target (improved) future.Organisational trajectories are determined by a set of navigational forces that act like invisible rail-tracks – often coming together like complex junctions and inter-sections. The more established the organisation, the more powerful these forces will be and more difficult they are to change. Only by understanding and addressing these forces can informed choices be made and actions taken to control their influence, and thereby change the trajectory away from the default future to the target future.Some of these forces, like economic climate, regulation and customer behaviour, come from outside the organisation, while others, like structure, technology and mindset, originate from within the organisation.Equally, some of these navigational forces are easy to observe (like the impact of technology or regulation), while others, like mindset, values, culture and informal networks with vested interests, are often hidden deep within the organisation and are not apparent to the untrained eye.Some of the most powerful navigational forces that we have observed are given below. 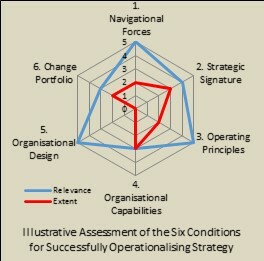 Examples of the Most Powerful Navigational ForcesPast winning strategies – based upon the belief that “what has made the organisation successful in the past will be sufficient to make us successful in the future”. Macro-economic climate – that determines how markets, customers and suppliers behave around the globe. Regulation – aimed at protecting the rights of customers, employees and the environment. Legacy IT systems – where past technology choices have established a complex set of interconnected systems and infrastructure that cannot be changed or replaced without considerable risk and cost. Processes – that are accredited and therefore difficult to change. Organisational capabilities – that reflect past success rather than our future needs. Complexity – of products, services, operations and technology. Leadership – that is not able to think strategically. A strategy defines where an organisation aims to operate along a small number of strategic axes, where each axis represents a source of value. Strategy therefore comprises making explicit choices about which sources of value an organisation decides to pursue and where, along each axis, it chooses to position itself. A strategic signature is the overall ‘shape’ given by its position on each of the strategic axes.Most organisations in the same sector will have similar strategic axes – it’s where they decide to position themselves that determines the uniqueness of their particular strategy. For example, retail banking has a set of strategic axes: one of which is the service it provides to enable customers to pay bills and transfer money. This axis is often called payments, current or cheque accounts. This strategic axis offers a spectrum of choice and where a bank chooses to position itself on this spectrum defines its strategy. At one extreme it could provide a full range of payment facilities available through its branch network, by telephone, via the Internet or mobile devices. At the other extreme it could choose to offer a more limited set of payment services, for example only via the Internet. If a bank also provides mortgages it would be operating on an additional strategic axis (source of value). This spectrum ranges from basic repayment mortgages through to offset mortgages linked to current accounts. Equally, if it offered insurance products it would operate on an additional strategic axis. 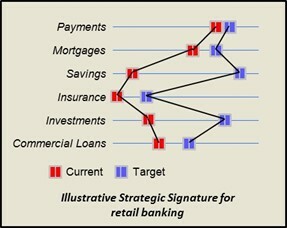 An example of the typical strategic axes for retail banking is shown in the above illustration.Further reading on this topic can be found in the Formicio article Making Your Strategic Signature Explicit. Operating principles define how the organisation intends to operate in the future and thereby the trajectory it has chosen to travel. We will not seek out acquisitions or respond when approached. We will build on our core products and customer base. We will need to develop new organisational capabilities. Only by making the implications explicit can people across the organisation (at all levels) understand their role and accountability in operationalising the strategy. Further reading on this topic can be found in the Formicio article How Operating Principles Can Make Strategy Meaningful. 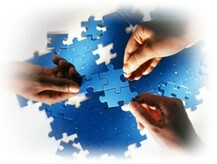 Organisational capabilities comprise everything that is required to deliver an outcome of value. They are formed from shared mental models, frameworks, language, processes, tools, mindsets, beliefs, shared experiences and individual skills. Whereas competencies are held by individuals, capabilities are held within organisations and are not lost when key individuals leave. Obviously, it’s not possible for an organisation to have capabilities without having competent people. But these people don’t need to be super-smart or highly intelligent because organisational capabilities are developed through application and practise. Like muscles, they get stronger the more they are used. Also, the more embedded they become, the greater their influence on organisational culture. They can also become organisational habits, where people collectively do things in a particular way without consciously knowing how or why.Having the right organisational capabilities in place is important as they help to pull the organisation into its target future. Equally, having the wrong ones in place can anchor it to the present. For this reason we believe organisational capabilities should be managed as a portfolio. Over time, some organisational capabilities in the portfolio will need to be strengthened, while others are retired. And new ones will need to be acquired.Examples of organisational capabilities are given below and further reading on this topic can be found in the Formicio articles Using Organisational Capabilities to Pull the Present into the Future and Managing Organisational Capabilities as a Portfolio. Examples of Organisational CapabilitiesInnovation: the ability to continually develop new products and services and successfully bring them to market for commercial success. Acquisition integration: the ability to identify, acquire and integrate acquisitions quickly and effectively in ways that preserve and nurture what has been acquired. Adaptive organisations are more able to operationalise strategy than those based upon rigid structures. Clarity of the target improved future. Understanding the contribution of each initiative in pulling the organisation into its target future. Criteria by which contending initiatives can be continually prioritised. Clearly defined decision rights for stopping, starting initiatives and rebalancing the portfolio. A culture of openness, honesty and trust. An absence of personal egos and pet projects. The essence of successful portfolio management is the difficult decisions that result from crucial conversations with stakeholders of the present and the future. Further reading on this topic can be found in the Formicio article Developing Portfolio Management as an Organisational Capability. The six conditions discussed above can be assessed in terms of their relevance (at a point in time) and the degree to which they are currently in place. The value of such an assessment is twofold: firstly, they can act as a powerful leading indicator as to whether operationalising the strategy will be successful. Secondly, they provide a framework for creating the right dialogue with colleagues. An example of how the results of such an assessment could be presented is shown in the illustration on the right. Don’t think about operationalising strategy once the strategy has been developed. Think about it as the strategy being developed, making it part of the process. By doing so, the strategy is more likely to become operational reality. Operationalising strategy involves more than implementing a plan: it’s about getting the organisation to behave and operate in a way that is aligned with the target future. Approaches that pull from the future rather than push from the present are more likely to succeed. Pulling from the present into the future involves establishing six conditions for success. The conditions for success can be assessed in terms of their relevance (at a point in time) and the degree to which they are in place. The role of leaders is to ensure that the conditions for success are put in place and sustained.